Observations on Shakespeare's relevance to our 21st century world. Interviews with practitioners of Shakespeare—theater professionals, teachers or students, or fans of The Bard and his works. We invite you to start your own discussion or share your own particular Shakespeareances. 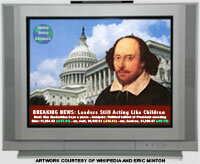 Your terminal for discussions about Shakespeare's work in practice and its impact and relevance on 21st century society.